Maybe he didn’t say that. I might be mixing it all up with Groucho Marx never taking his cigar out of his mouth. Anyway, with a new year about to unfold, it would be a near miracle not to hear at least one rendition of “Auld Lang Syne.” But who would want to miss it? It’s hard to imagine a more apt and achingly bittersweet song for a time when we simultaneously say farewell and welcome. Cynics are free to disagree, others can enjoy the version we’ve cued up here, which also makes evident that the song shouldn’t be limited to a New Year’s Eve anthem. Beethoven actually made a lively arrangement of the tune, and I was tempted, but this excerpt is from the October, 2004 dedication of the new Scottish Parliament building. The Queen spoke, Sean Connery attended, as did the novelist Alexander McCall Smith, all briefly glimpsed in the video. We’ll eschew a scholarly treatise of the song here. 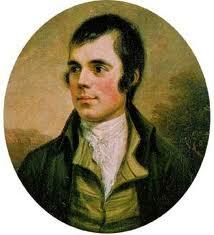 Most think it wholly the creation of Robbie Burns, but he actually breathed further life into even older fragments of Scottish verse. He put a different tune to the song, which singer-songwriter Eddi Reader begins with here, before coercing the assemblage into joining her with the more familiar melody. Through the centuries of iterations, the lyrics may now be a linguistic puzzle, but it doesn’t seem to matter in lachrymose terms. It’s a little like golf. The origins may be a bit obscure, but the current manifestation seems perfect in its affectiveness. This is the third Ommegang beer we’ve recommended this year, from the seasonal Zuur to the year-round Abbey Ale, where we went into the Belgian connections of the Cooperstown, New York brewery. And in the post on the Belgian Scotch Silly we pondered how the Scots influenced Belgian brewing after World War I. 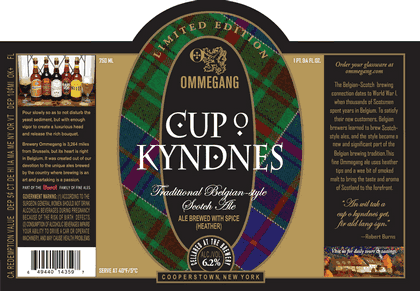 But it’s on the Cup O Kyndnes label, too. So now we have a seasonal Belgian-American Scotch Ale brewed with some heather tips and a touch of smoked malt and roasted barley. The result is a deep amber beer with pear-like aromas in a well of malt. But it’s a bit spicy rather than overly sweet on the palate. As the beer warms a faint peaty, soapy touch reveals itself, and it all finishes in a lightly hopped wisp. However this year finishes for you, friends, thanks for joining in. Let’s take a cup of this right gude-willy waught for auld lang syne, and look ahead to the journey into 2011. Cheers! I watched Yasujiro Ozu’s “Early Spring” last night, and was surprised to see it had a late scene making emotive use of “Auld Lang Syne,” giving it something in common with “It’s a Wonderful Life”–and about 100 other films. The Japanese version is called “Hotaru no hikari” and refers to the “Glow of a firefly,” rather than the Burns’ lyrics. But there’s no question–at least in this film–that it conveys the same bittersweet sensations. Well done, Thomas. A hearty Happy New Year to you. It was great to see you in 2013 and I wish for the same in the coming year. All the best. Sounds like a good plan, Joe. Have a grand one.